Throughout the Middle East, many Muslims and non-Muslims have fallen victim to suicide bombings. In fact, more Muslims have been killed in suicide bombings in the region than Jews and Christians. This extreme form of violence has been the subject of many studies. Researchers have been baffled as to why someone, mostly at a young age, decides to take the lives of others and end his/her own life in the process. Questions have revolved around such topics as religious teachings, ideology, nationalism, and hatred of the “other.” In a unique and novel approach to the issue of suicide terrorism, Dr. Nancy Hartevelt Kobrin takes an entirely different look at this topic and informs her audience of aspects of suicide terrorism that can offer new directions for policy makers and for the field of counter-terrorism around the world. Dr. Hartevelt Kobrin is an Israeli psychoanalyst and counter terrorism expert and a fellow at the American Center for Democracy. She is the author, most recently of, Penetrating The Terrorist Psyche, in which she delves into the dark world of Islamic suicide terrorism using psychoanalytical methods that include early childhood development stages. The following discussion with Dr. Hartevelt Kobrin was conducted by Arian Moradzadeh. Mr. Moradzadeh is an independent researcher in psychoanalysis and translator of essential works in the field of psychoanalysis from German language. How would you assess the state of psychoanalysis today within psychological disciplines? It is a very good question how the confluence of psychoanalysis continues to evolve and engage with other disciplines, yet within the field of psychology, psychoanalysis has generally been marginalized. Paradoxically, psychology as an academic discipline could never have developed without its psychoanalytic roots. Since I am deeply involved in counterterrorism, I have found that psychoanalysis provides us with invaluable tools for they are the only tools that can decode the unconscious rage and promote a better understanding of terrorism. Nevertheless, there has been great resistance to integrating the studies of psychoanalysis, which allows us to delve into the psyche of the terrorist for the field of counter-terrorism. I understand how frightening this special knowledge is that counter-terrorist experts themselves are ironically quite terrified, which accounts for their denial. It does take an analytic mind to contemplate and to see the linkage that exists from early childhood. The inclination toward violence is in place developmentally by age three. If it goes undetected, the rage festers below the radar until it bursts out during adolescence or later to the shock of everyone. This is similar to the personality development of the serial killer, to cite only one example. During this early time frame the terrorists are not developing empathy, usually something that occurs between the mother and the baby in their relational bond. The personality is essentially “set in cement” by age three. This also takes into account genetic predisposition along with the neuroscience of the brain, which also plays a major role in violent aggressive behavior. Thus, by the time the child goes off to school, the proclivity for aggressive behavior and violence is already there. My goal is to engage counter-terrorist experts, policy makers and the general public with these tools to help understand the intricate interplay between early childhood development, the devalued hated object of the female and its ramifications for violence contributing to suicide bombing. In no way is this meant to blame and devalue the female further because she is the lynchpin for remedying the problem. What are the mechanisms of a suicide terrorist’s action as an unconscious form of patricide? Fortunately, Sigmund Freud did not live at a time when there were suicide bombers. If he did, he would probably view these aggressive sadistic/masochistic acts in classic psychoanalytic terms as an extreme Oedipal conflict. In today’s world this would turn many non-psychoanalytic scholars off. It is difficult for many to understand the assumption that the devalued status of the female helps to spawn suicide attacks. It is an unconscious paranoid act of violence, which is the outcome, in part, due to the early bonding relationship between mother and infant. The trauma of her being the target of abuse and ongoing hatred and never having the opportunity to heal from being the shock absorber of such hatred within a dysfunctional family set within a shame honor culture and religion causes significant problems. Instead of developing normal maternal feelings for her baby, she experiences the needs of her baby unconsciously as attacking and persecutory. I came to the conclusion that it wasn’t so much patricide as it was matricide. In 2010 my theory was confirmed by a documentary maker who had read my work and had also spoken with neuroscientists who felt that it was very difficult for a mother to bond with her baby in shame honor cultures that advocates wife beating, female genital mutilation and honor killing. This is NOT to blame the female, but it is hard to access the empathy necessary to develop a healthy loving bond with her infant free of unconscious recycled hatred. One has to look to the nonverbal language of the terrorists and read their violent behavior in conjunction with their dysfunctional family dynamics. Unlike many followers of Freud who stressed the mother, Freud stressed the importance of the father and how he plays a role in helping the son to overcome Oedipal rivals not through aggression. In Islam the father does play a role, basically absent or ineffective mainly because he never had a role model of a father who effectively set limits in a non-violent manner. The learned model of behavior is to act out violence rather than to put feelings into words and resolve conflict. Some may say that it is not possible to import psychoanalytic thinking to a non-Western culture but Abdelwahab Bouhdiba, a leading Tunisian sociologist, in his book, Sexuality in Islam, demonstrates that Muslim culture harbors the Judar complex which is based on the negation of the female. There are also many psychoanalysts who are Muslim. The field is very diverse. I arrived at this conclusion myself by looking at the terrorist communication in the suicide attack. Terrorists do not have a sense of autonomy and independence because in Arab Muslim culture, and all other shame honor cultures, you are not permitted to separate from the mother. Shame plays a significantly traumatizing role since children are shamed into behaving which causes rage. Children are not listened to, and they are treated like objects. When they grow up, they treat others as objects. My work also explains why there is radicalization and the problem of western converts because in the West we, too, have pockets of shame-honor families. We are more alike than different as human beings. Allow me to add one more note as some people say, well what about the Tamil Tigers and the large number of female suicide bombers they produced. They are not Muslim. Yet they too came from a shame honor culture, where the female is also devalued. Nevertheless, the majority of terrorist attacks take place in the Muslim Middle East. Islam is the fastest growing religion/political movement in the world and its ideologies have a higher rate of frequency of violence in comparison to other religions. Since aggression breeds aggression, it has to be immediately curtailed when it occurs. Limits have to be set. If not, it spreads through imitative behavior. Jihadi violence has a peculiar kind of sadomasochistic tone to it, which is an unspoken attraction for those who are seeking justification for committing their acts of violence. What role does the individual’s “social unconscious” play in your book? The role of the social has extreme importance for we are dealing with a shame/honor culture. In these cultures, it is the group self that has more importance than the individual self — a “we” culture as opposed to the West, which is a “me” culture. Individuality is felt to be a threat to the group. In conjunction with this, we must introduce the role of language, verbal and nonverbal, because it structures our unconscious and by extension reality. Even their child rearing practices are imbued with group thinking rather than focusing on the individual needs necessary for healthy child development. The attraction to jihad becomes a more pervasive force than life itself. A vast number of kids coming from shame honor western families are attracted to jihad. Jihadis love explosives and fire. It reminds me of my interview of a little boy on a locked psychiatric ward when I was in training. I sat down to interview him at a children’s table and immediately felt his foot on top of mine—the sign of dominance. He had been hospitalized for setting fires. I realized that his nonverbal communication was a projection literally on to me of his terrors about being interviewed by me and the issue of trust. Trust was not something found in his early childhood experience. He had no sense of basic trust. This anecdote shows that we must “listen” carefully to understand the terrorizing behavior that targets us as its potential victims. There are a lot of articles and books published on the suicide bombers with titles like “talking” to terrorists. Yes, talking is important but even more critical is listening to them and using your own body and training as a kind of unconscious psychological tuning fork, because the split in their psyche runs so deep and their projections so forceful and overwhelming. This ‘listening” is a tool uniquely developed by psychoanalysis referred to as the third ear. Empathy and shame/honor cultures do not go together. Lacking is the necessary empathy for basic trust. If it is not there, it keeps one forever terrified. A parent has to be there to help the child with his/her emotional experiences in life, which can be confusing and enraging. Child rearing practices are culturally informed and shape the social unconscious of the child. How a culture and religion sanction aggression will be transmitted to the child. It is learned behavior in the home before the child reaches school. While schools play an important role in incitement to violence as in the case of Pakistan, Afghanistan and the Palestinian territories, to name a few, where teaching hatred of the “other” has been institutionalized. School is still relatively late in the development of personality. The mother plays THE critical role because she educates the child in utero through age three before s/he goes off to school. The Cypriot Turkish psychoanalyst Vamik Volkan has written that the need to hate and the need to have an enemy is in place by age three. Furthermore the Egyptian sociologist Halim Barakat has noted that the family is a microcosm of society, stating that if you have a dysfunctional family, which is not egalitarian, you will have a dysfunctional society. Why is this so? I state that its citizens do not develop the requisite “psychological” infrastructure for a democracy. To wit, the Arab spring failed. What, in your opinion, is the most appropriate method of transference to educate government authorities on the psychoanalytical aspects of suicide terrorism? In order to understand how transference methods can impact change in people’s attitudes, we must first take into account the nature of group psychology. According to Wilfred Bion the well-known psychoanalyst and expert on group behavior (and by the way he served as a British tank commander during WWI wherein close quarters one would learn quite a bit about group dynamics), he noted that the individual thinker is a rare species. He discusses two types of groups: the work group and the basic assumption group. The work group is basically the task-oriented group, those who are goal-oriented, those who do not allow primitive defenses to get in the way of thinking. They are the “reality-based” group. The second set of groups is the ones dominated by primitive defenses such as denial, splitting, projection and projective identification. To do so requires this kind of introspection to question and explore their own rote-like responses, to question their own basic assumptions in order to explore their feelings and defenses that keep them from seeing clearly what the reality is. We all have our own “internal” terrorist, which means that we are all terrified to some degree to acknowledge this aspect of the unconscious terrorist communication. Realistically speaking, this does not mean we must now put all governmental officials on the couch, but we do have to provide some methods for them to learn how to handle their own aggression and rage, and deal with their own internal terrorist. Even in the West we have a long way to go with regard to the treatment of the female, sexual harassment, violence against women and minorities, etc. These are intersecting problems. In my first book The Banality of Suicide Terrorism, I conclude by stating the importance of focusing on the little Muslim girl to help and guide her in ways to disengage her from her devalued status. To allow her the freedom and the honor that one day she will become the mother. She has the burden of teaching her child not to hate, while at the same time she has also been highly traumatized by her religion and culture. My colleague Dr. Joan Lachkar has advocated programming and dialoguing that focus on bonding with culture through music, the arts and food, (sensory perception) – aspects of nonviolent cultures in order to familiarize people, bridging the gap between people, seeking nonviolent ways of engaging. In Saudi Arabia they came to realize that engaging the imprisoned terrorists in art therapy was a way to begin to encounter their highly dissociated violent minds. Nevertheless, the rate of recidivism will be high because the problem is so early developmentally; the intervention comes too late. Yet for as long as Saudi Arabia remains a closed society, hatred will persist because it allows for hatred of the female and the “other,” including the anti-Semitism found in Islam. The same goes for Iran, where the situation is even more complicated because Shia Islam has violent rituals and they feel themselves to be the victims in the larger picture of the ummah, the Muslim global community. The key is education, introspection and understanding about group formation. How would you analyze the psychological mechanism a charismatic leader has, as a unique source of power, with his suicide terrorist followers? Most psychoanalysts and other experts like Irving Schaffer, who wrote a very interesting book calledCharisma: A Psychoanalytic Look at Mass Society have focused again on the need for the father. While there is no doubt a father hunger exists for the terrorists who think they are unconsciously seeking out and hooking into a charismatic paternal figure. However, through my work I discovered that the violence they commit speaks to the deep split in their psyches concerning their bonding relationship with their mothers. The father is a symptom of the underlying problem of the devalued female as he was once a little boy who had value only as a narcissistic object of alleged honor for his devalued mother in the shame honor group. I point to the intense bonding that takes place between the mother and the infant as the seed for seeking out a charismatic leader in order to fuse with him because the personality lacks a sense of identity. It is a heliotropic process and they hook into the charismatic leader as a source of support, “now I have found an identity” through a strong leader. Yet the strong leader has a maternal dimension. We know this when we look to murder-suicide configurations, be they domestic violence or rampage shooters who then commit suicide, that these lethal actions are a way of bonding to the mother thereby seeking a rebirth fantasy in death. In fact, in another shame honor culture, Japanese, the Kamikaze pilots were told not to fear death because when they were within meters of their target the face of the mother would reappear. It is part of this charismatic pathological maternal bonding. The mother is the first person we bond with in life and hence the power source. The experience sets the template for all other relationships. Irwin Yahlom, a psychoanalyst, wrote that mother is so ingrained in the interstices of our mind, we are not even aware of it. Buried beneath the alleged “paternal” nefarious charismatic leader, lies our first charismatic experience with our mother. Osama bin Laden’s mother was devalued and abused by his father. He grew up in a huge Saudi family with over fifty siblings. Bin Laden reenacted and recycled this dysfunction by creating a “family” called Al Qaeda in which he could act out his rage by having been raised by an abused mother and an absent father. He just managed to get a way with committing his violence, which exceeded murder itself under the banner of jihad, turning the familial violence into political violence. What role does gender segregation play in a terrorist’s psyche? Separate is not equal. In radical Islam there is strict gender apartheid. This separation is a revealing sign. It is a nonverbal communication about the psychological splitting which occurs early on in the traumatic bonding with the mother. They split off all their bad feelings. They purge themselves by projecting their self-hatred outward to keep themselves “pure.” Hence all their talk about purity. They have a weak sense of their maleness so they must create the separation as a means of controlling the terrifying female. It tells us how they feel about the female body. Terrorists do not understand how they could be born from such a devalued body, the site of shame. In the “we” group of a shame honor culture, the female body is contaminated and contaminating, which means that they must keep apart from it, i.e., her. They must also control and manipulate her. The mother is heroically portrayed as larger than life because it is an overcompensation (defense) against inadequate. They are in conflict. Terrorists conduct in bullying. It is hard for the female because this unconscious message is blasted at her day in and day out through all sorts of subtle and not so subtle manipulative ways. She internalizes male rage of the female as self-hatred. She has been treated as an object early on and in turn. This is the model she has for her children. It remains very hard for her to break out of it. She must find avenues to get rid of her rage and that is why, you have female jihadis like the Black Widows (Chechen) who “out French the French” in their revenge suicide bombings. Suicide terrorism becomes an easy way to purge themselves of their own rage through eliminating death while at the same time finding an identity in a society in which they are faceless. Gender apartheid plays out the paranoia, which occurs first in the home. 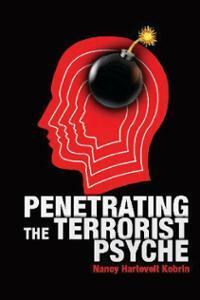 It supports the psychological splitting and the deep split in the terrorist psyche. They can remain dissociated from their own terrors and just hate and kill rather than choosing to have psychological awareness. However, the mother is the key to decoding the terrorist behavior. Like a palimpsest lying beneath an oil painting the terrorists paint the unconscious conflict of their minds, their maternal drama, on “the canvas” of a suicide attack site. They are so preoccupied by the fact that they have not separated from their mothers that their behavior is at near conscious level like children in play therapy. Unfortunately, for us, it is not play and very lethal, spreading like wild fire. The mother is always there. Take for example, the Al Qaeda e-zine Inspire’s article “How to make a bomb in the kitchen of your mom.” It is a clear misuse of the kitchen and unconscious rage meant for their mothers, yet again experts and the public remain duped. We gloss over the unconscious meaning because it is too terrifying that it could be that simple. In your book you write about hate-oriented trauma and its social consequences. Can you elaborate on it? Hate-oriented trauma paralyzes an individual and in a very specific way. The hatred is so pervasive and ongoing that the targeted object of hatred becomes numb to it – dissociated from it. One can be high functioning and yet behind the scenes at home, be chronically abused and in denial. Often even therapists miss what is going on in the home because of our own unacknowledged terrors and wind up colluding with the terrorist. My colleague Dr. Joan Lachkar has written extensively about this and I have added a dimension to this problem in tracing out the institutionalization of unacknowledged unconscious hatred which can be found in different disciplines like the field of psychoanalysis, the practice of psychotherapy and the discipline of counter terrorism. These should be thought of as mirror image denial of the terrorist acts. Being dissociated from the swirling unconscious rage and violence of terrorism courses through all sectors of society. It does not allow us to see what is really going on. In counter terrorism they like to keep political violence partitioned off from all other kinds of violence. This, in my opinion, causes blind spots. The deep waters of denial and dissociation help contribute to an illusion that there is progress. We saw this in Afghanistan and also Iraq. The belief was that things were getting better. This fallacy demonstrates that it was poorly understood the degree to which the developmental problem exists in terrorism and in these violent societies. For as long as the female remains the permissible object of hatred, the violence will not be diminished. This deeply affects men in all shame honor cultures, societies and families because their mothers were the devalued object of hatred and the cycle goes on. The little boy cannot possibly have a good feeling about his self if he sees his mother being beaten. She is an extension of him. As a child he was dependent upon her. This causes great rage in him. He must find an avenue to deal with that rage. In tightly controlled gender apartheid societies, he can not get his needs met for warmth and affection in a balanced, healthy way. He rages and projects outwards from domestic violence, to crime, to radicalization, to jihad. Rare is the individual who desires to have psychological understanding of him/her self. It remains difficult because of the shame these children have experienced early on. Being hated is interpreted as being impotent, helpless, defective and shamed. Shame is a powerful emotion that has been underestimated in terrorism. To conclude, from all my work over these years, I observe that shaming happens very fast. It is disconcerting and crippling. The projections are forceful. When someone envies the genuine strength of another, they become attacking, destructive and violent. They cannot tolerate the fact that the other, the hated objected, has been able to become resourceful, strong, vigorous and independent. Hence the terrorists must repudiate and destroy. In order to solve the problem of political terrorism we must begin to recognize the unconscious psychodynamics of the terrorist’s terrors, his project of them and the meaning of the object of hatred. We must also acknowledge our own “internal terrorist” which each of us harbors due to our own terrors growing up. To do so, is to genuinely begin to deal with the problem of political terrorism. Education is key concerning this matter. Treatment of the female who becomes the mother remains the lynchpin for solving this pervasive, global problem. We must muster the courage to explore this aspect of early childhood development and its relation to the psyche of the terrorist. Finally, I wish to thank the Foreign Policy Association for being so forward thinking in opening up such a discussion within these pages concerning the political violence of terrorism. It is a much needed step in the right direction.